Is it possible to mourn the outcome of this election and feel gratitude? “It’s like losing a loved one,” a friend remarked as we spoke of our upset that a man who denigrated and objectified women, directed hate talk to minorities, mocked the disabled, lead the charge to jail Hillary, is now the president elect. In the aftermath, we experience sadness. Are not the tears in this sadness embedded in gratitude? Had I not admired, respected, and trusted Hillary, would I feel this bereft? Had I not felt enormous gratitude for what she gave and endured in those long, difficult days of confronting the challenges of being the first female presidential candidate in history, would I feel so beleaguered? I am grateful: Hillary ran for president, not once, but twice. 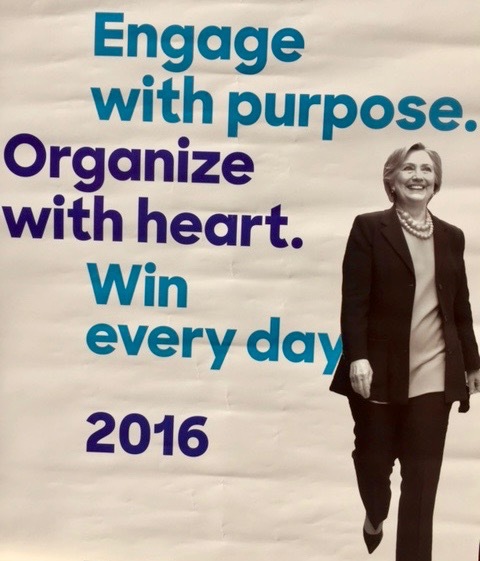 The first time, in 2008, I stood in a long line with my friend, Rosemary, to attend Hillary’s primary rally at Boston’s Symphony Hall. When she took the stage in her soft yellow pantsuit, I stood and cheered, my heart pounding with anticipation and pride in a woman candidate. I was 76 years old. I recalled how, growing into womanhood, I admired two outspoken women: Eleanor Roosevelt and Margaret Chase Smith. Eleanor was her husband’s eyes and ears, his advisor. Smith was among the first to criticize the tactics of McCarthyism the year I graduated high school. McCarthy frightened me; Smith called him out, stood her ground and spoke out against despotism. In 1964, Smith ran as a candidate for the Republican nomination but lost. That rally night at Symphony Hall, the golden-walled space rang with excited applause and sisterhood. Hillary was passionate; we were passionate with her. Like Smith, she lost that first effort and to my surprise, she picked herself up and accepted the job of Secretary of State. The job was brutal, requiring resiliency, flexibility, grit and yes, stamina. My gratitude grew as I read of her missions and watched her interviews on television. I appreciated both her grace and grit as she traveled the world, tried to negotiate fairness and safety. Election, 2016, her run for president seemed inevitable. Who could challenge her competence and knowledge, her dedication to civility and service? Of course, dedicated Bernie. I was grateful for two champions. I was grateful for the choice. Hillary won the nomination, paved the path, forged the way forward as far and wide as she could. I am grateful, yet mourn for what was lost— the promise of a steady, firm reasonable leader with heart for families and children of all races and creeds. Time for me to take the next step. Onward. This entry was posted in Currents, Mindfulness, Relationship(s), Sustainability, Uncategorized, Well-Being, Writing and tagged gratitude for Hillary, mourning election 2016, sisterhood on November 14, 2016 by fayewriter. this wave shall pass? Can you shed light on the rise and fall of something similar, like McCarthyism? I meant: do you think that this wave shall pass — strange typo! Your question gave me pause. McCarthy was a rebel senator.The wave of his “red scare” lasted about an election cycle, 4 years. With Trump’s unprecedented rhetoric and inciting behavior during the election process, the long term outcome is unclear. Since the election, the reportage seems more and more transparent. There is already a rising swell of opposition to his choice of Stephen Banlong as his Chief Advisor. I believe we all need to stay vigilant and do everything in our power to make certain that this wave loses momentum and is replaced with civility and respect for difference. Thanks Faye for putting all of our feelings into words so eloquently. It surely is a sad time for women in America. Joan, indeed, very sad for women in America. Beautiful essay, and yes tribute to Hillary Clinton’s determination, skill and grace; not to mention her courage. I like the essay’s pace and its details about Clinton’s leadership and her followers, including a reminder of that yellow pantsuit at Symphony Hall! I must (respectfully) disagree with Tim Egan, though, regarding grief, which I think carries incredible power, even in politics–for example, assuring passage of the landmark Civil Rights Act of 1964, less than one year after the assassination of John F. Kennedy. Rosemary, I understand your concern. I did not intend to imply that I disregard mourning. It’s an essential part of healing. As for myself, given the political climate and the quickness with which Trump is moving ahead, I felt an imperative to move towards vigilance and considered action. individual differences are respected, and hopefully consistently and gradually followed. We have many democratic leaders who have already come forward, including Obama and Clinton, to charge ahead in this vital area. We hopefully will follow in their footsteps. Thank you, dear friend, for providing us with a safe arena in which to express our strong political feelings. You have eloquently and informatively set the stage for free expression and respect for individual differences. Thank you, Bev. There is so much to attend to, so much effort ahead.